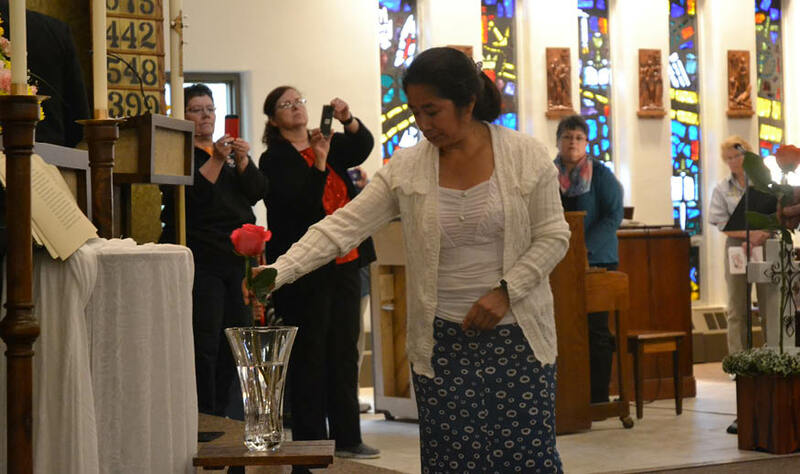 POSTVILLE — On a rain soaked Friday recently, immigrants and their supporters gathered at St. Bridget Catholic Church in Postville for an interfaith prayer service to commemorate the 10th anniversary of an immigration raid that was the largest of its kind in the U.S. up to that point. 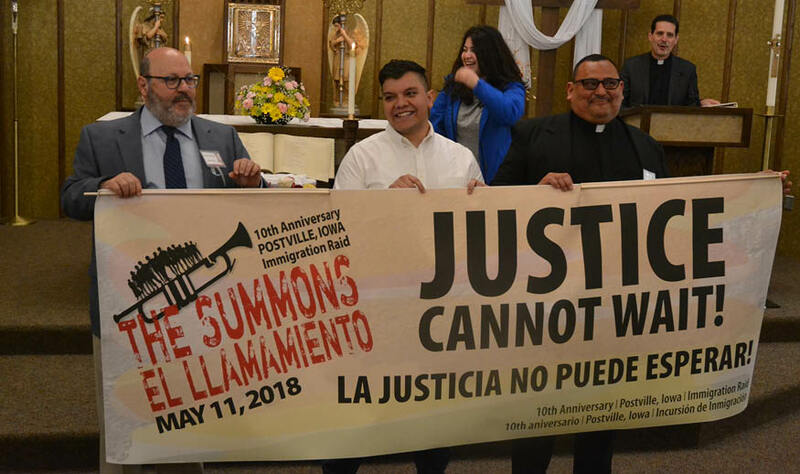 “On May 12, 2008, at 10:02 a.m. the history of Postvillle was changed dramatically,” said Father Nils Hernández, pastor of the Trinity Cluster, of which St. Bridget Parish is a part, during his introduction at the May 11 event. (Left to right): Archbishop Emeritus Jerome Hanus, OSB, former prelate of the Archdiocese of Dubuque; Bishop Steven Ullestad of the Northeastern Synod of the Evangelical Lutheran Chuch of America; Archbishop Michael O. Jackels of the Archdiocese of Dubuque; and Rabbi Morris Allen of the Beth Jacob Congregation. The archbishop was among speakers from the Christian, Muslim and Jewish communities who led prayers or made speeches. Remarks were in both English and Spanish. The prayer service was held just days after an immigration raid near Mt. Pleasant that led to the arrest of 32 immigrants from Central America working at a concrete plant outside of town. Many of the speakers at the prayer service and a rally afterwards, that was held inside due to the weather, talked about the need for comprehensive immigration reform legislation to be enacted. 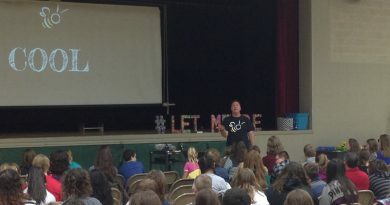 The theme of the event was “The Summons,” referencing a call to action. Pedro Lopez, a recent graduate of Luther College, was among those calling for reform of the immigration system. His parents came to Postville from Mexico, and his mother was deported as a result of the 2008 raid. He used the phrase “Si, se puede” — roughly translated to “Yes, they/we can” as he told his parents’ story, and used it to express hope for the future. Lopez and his mother were among those who placed a book with the names of those arrested in the raid and roses on the altar during the ceremonies. As part of the event, a video of Mercedes Gomez was shown. She was among those jailed and then deported after the raid. Some of her siblings, and, later, her parents were able to obtain visas to legally return to the U.S., but she continues to live in Guatemala. On day of the raid, federal agents collected evidence showing violations of child and other labor laws, safety rules infractions, sexual abuse of female workers and document fraud. They arrested almost 400 immigrants who were in the country without legal authorization and took them for mass processing at the National Cattle Congress in Waterloo. A majority were charged with identity theft but pleaded guilty to lesser charges as part of a plea bargain. Most did not understand the charges against them and were not, in many cases, given adequate access to legal counsel, according to witnesses who were working with the immigrant community. Many served about five months in prison and were then deported to their home countries of Guatemala, Mexico, Israel and Ukraine. 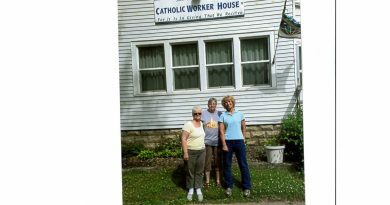 Many female workers were permitted to stay in Iowa to care for children, but were required to wear ankle monitoring bracelets and could not work for up to two years while waiting for a long judicial process to unfold. The plant was re-opened after being purchased by a new owner, Agri Star Meat & Poultry. Some workers from the time of the raid returned, but many have not, and in subsequent years refugees from Somalia took some of the vacant jobs. Asha Aden, a student at Luther College who is a member of the local Muslim community, spoke at the event, telling the story of her parents escape from the civil war in Somalia. They came to the U.S. in 1993 as refugees. Members of the Jewish community also attended the events, including Rabbi Morris Allen of Beth Jacob Congregation. In expressing his support for the immigrant community, the Rabbi recounted the ancient Jewish history of being migrant workers and, later, slaves in Egypt. He alluded to the previous misconduct of the former owners of the meat processing plant, who were Jewish, and emphasized that their actions aren’t emblematic of the wider Jewish community. Rabbi Morris pledged to continue the Jewish involvement in helping immigrants. Sholom Rubashkin was CEO of Agriprocessors at the time of the raid. He was found guilty of 86 counts of bank fraud in2009 and sentenced to 27 years in prison. Rubashkin served time in prison since 2008. In December 2017, President Trump, a Republican, commuted Rubashkin’s sentence with bi-partisan support, including that of Democratic House of Representatives Minority Leader Nancy Pelosi. Rubashkin’s commutation doesn’t vacate his conviction. It leaves in place a term of supervised release and a restitution obligation. The commutation came after legal experts and members of congress expressed concerns about “evidentiary proceedings” and the “severity of the sentence” in the case, according to a White House statement. In 2011, filmaker Luis Argueta released a documentary called “AbUSed: the Postville Raid,” which tracks what happened to many of the deported workers and some of their efforts to stay or re-enter the country legally through a progam called the U-Visa, which is set aside for victims of crime and their family memebers. In his reflection at the prayer service, Archbishop Michael Jackels, prelate of the Archdiocese of Dubuque, said many “good words” had been said during the course of the event. Archbishop Jackels concluded his comments by urging people to take action as a result of their faith and convictions. Sister Mary McCauley, BVM, who worked in administration at St. Bridget Parish during and after the raid, echoed this sentiment. 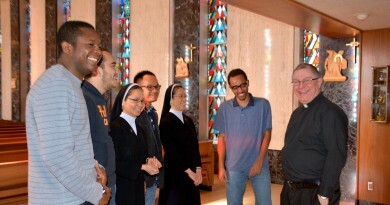 “In our country today, our immigrants and refugees, our young dreamers and DACA recipients are summoning us as well as our legislators and president to pause and reflect on our American values and on the absolute necessity to enacting immigration policy that is just, humane and fair,” said Sister Mary. 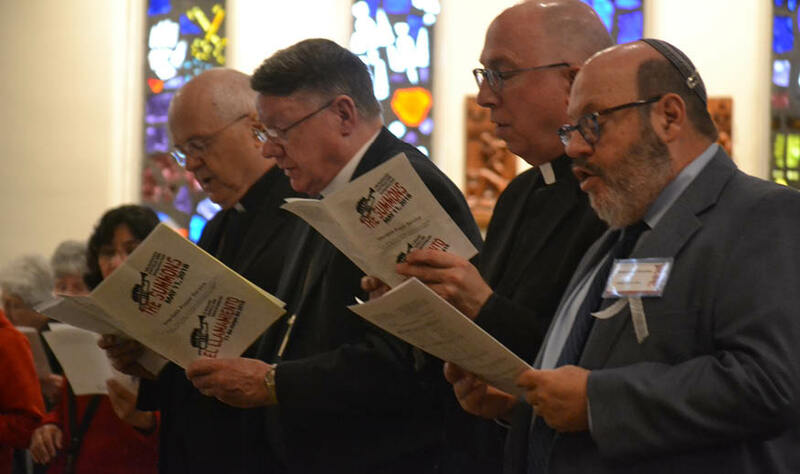 After the prayer service, the rally ended with the invitation for those in attendance to sign a pledge to continue hearing the “the summons” by working for immigrants and immigration reform. DUBUQUE — Following an immigration raid by law enforcement officials at a concrete business near Mt. Pleasant, staff from Catholic Charities of the Archdiocese of Dubuque is coordinating with other organizations to provide legal assistance to the 32 immigrants detained May 9. The group of male workers, who authorities said are in the country without legal permission, come from Mexico and Central America, according to Yer Vang, director of legal services for Catholic Charities of the Archdiocese of Dubuque. “We attempted to visit detainees in Linn County and Hardin County,” said Vang. 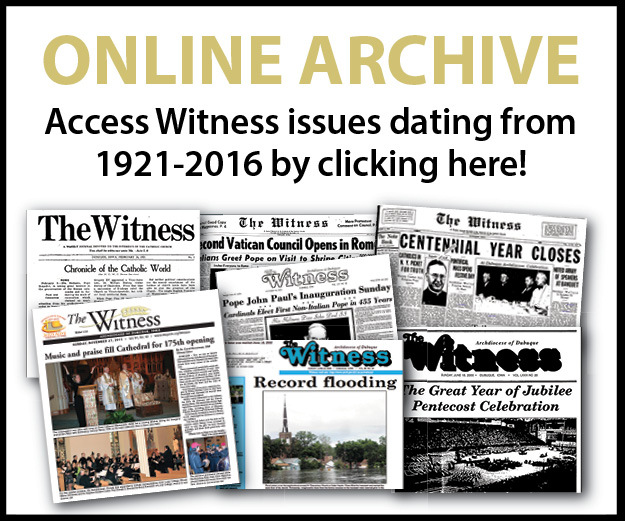 The agency is working with several other churches and charitable organizations, including Catholic Charites in neighboring dioceses. They are offering legal services to the individuals affected by the raid, while other organizations tend to the families of those who have been detained, she said. “We will continue to monitor the situation and do our part,” said Vang.